Fig. 1: (left) Shy albatross Thalassarche cauta, (right top) Cory´s shearwater Calonectris diomedea, (right bottom) peregrine falcon Falco peregrinus. © Simon Jungblut, PolE. During our fifth and final week, we first entered the Gulf of Biscaya. Luckily, we were spared by the storms which are typical for this region. We then continued through the British channel and the North Sea, and finally reached the Weser and Bremerhaven. Our cruise has thus reached its final destination, and Polarstern is back in its home port. Within the context of long-term observations to study the at-sea distribution of marine top predators, Polarstern is visited regularly by the PolE group (Laboratory for Polar Ecology, Head: Prof. Claude R. Joiris) to record marine birds and mammals in polar regions. However, the long north-south transects through the Atlantic Ocean are also of interest: they are used to investigate factors which determine the distribution from seabirds and marine mammals across the Atlantic Ocean, and cover the distributional areas of a lot of different bird and mammal species. ANT-XXIX/10 is the fourth trans-equatorial expeditions of RV Polarstern used to collect bird and mammal observation data for this area. On such large scale, very different biogeographical zones can be recognized with differences in ecological structure, in prey availability and thus in upper level predator abundance. The main water masses and fronts can be defined on the basis of hydrological factors registered on board Polarstern on a continuous basis: salinity, water temperature and depth. Only three days after leaving Cape Town, we reached the northern distribution limit of the albatrosses. The most frequent species of this family during our cruise was the shy albatross Thalassarche cauta (Fig. 1 left). The seabird showing the largest south-north distribution was Cory´s shearwater Calonectris diomedea (Fig. 1 right top) from 33° South to 38° North. Occasionally vagrants appear quite far offshore and utilize ships as resting places. 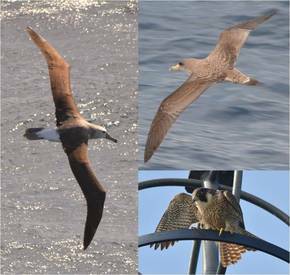 Amongst others we observed a juvenile peregrine falcon Falco peregrinus travelling a few days with us on Polarstern (Fig. 1 right bottom). While bird identification is eased by the fact that their body is fully visible for the human eye, marine mammals mostly expose only a very small proportion of their body to the air. Sperm whales Physeter macrocephalus (Fig. 2 left top) and fin whales Balaenoptera physalus (Fig. 2 left bottom) for instance, nicely and impressively illustrated in textbooks, only show the uppermost part of their heads and backs when swimming at the ocean surface. This can challenge the identification skills of the observer, as some baleen whale species look quite similar. Dolphins (Fig. 2 right: common dolphin Delphinus delphis) are probably the most appreciative cetaceans to identify. With impressive jumps, they often present their whole body and make it easy to observe. Regardless of the species, sometimes the observer simply has to be lucky to watch the animal at the right moment to recognize the main identification characteristics. Fig. 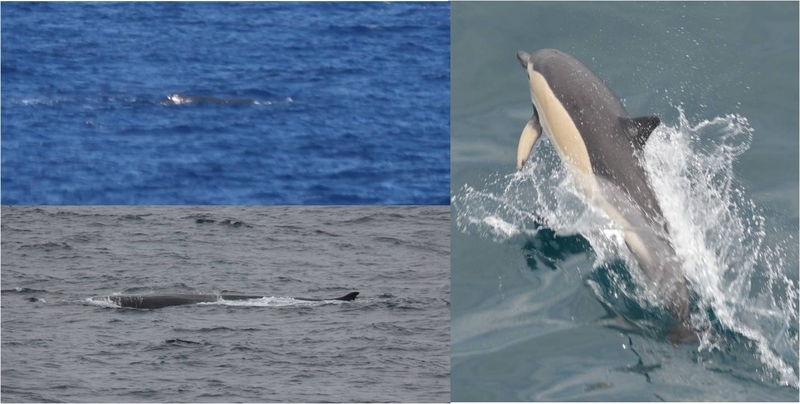 2: (left top) Sperm whale Physeter macrocephalus, (left bottom) fin whale Balaenoptera physalus, (right) common dolphin Delphinus delphis. © Dominik Nachtsheim & Simon Jungblut, PolE. On the way from Gran Canaria to Bremerhaven, a number of instrumental tests have been carried out on board. A detailed testing programme for the multibeam echo sounder Hydrosweep DS3 was completed. Also, the towed instrument carrier Triaxus was deployed for the first time on Polarstern. This was done by colleagues from the AWI, the von Thünen Institute, and MBT-Kiel, in order to evaluate the system performance. With the Triaxus, it is possible to probe the water column en route. Different sensors can be be installed, e.g. hydrographical sounds (CTDs) or a laser optical particle counter. The carried is towed in vertically undulating patterns – thus zigzagging up and down. This allows to resolve small-scale structures of the measured parameters – a clear advantage over the point measurements obtained by probes taken during often distant stations. During our cruise, the Triaxus system was successfully tested on different transects and with different instrumental configurations. Fig. 3: The towed vehicle Triaxus being lowered into the sea. © Daniel Stepputtis, vTI. In addition to the overview over our scientific work, we also want to offer a look inside the ship today. In principle, people can move freely on board Polarstern. The engine rooms are however off-limits for security reasons. Nevertheless, we had an opportunity to look behind the curtains and descend into previously unknown depths. Chief engineer Ole proudly lead us through his empire. To the outsider, the ship's hull is a maze composed of machines and tubes colored in bright green. Deep down, four ship diesels roar, each contributing 5000 horse powers and taking up the space of several garages. The control center resembles that of a power station. Sufficient reserves are required to carry up to 17,000 tonnes of load on long expeditions through the sea and through ice. 4000 cubic meters of diesel are stored on Polarstern. Units such as litres seem inappropriate – up to 60 tonnes are used daily while moving through ice. 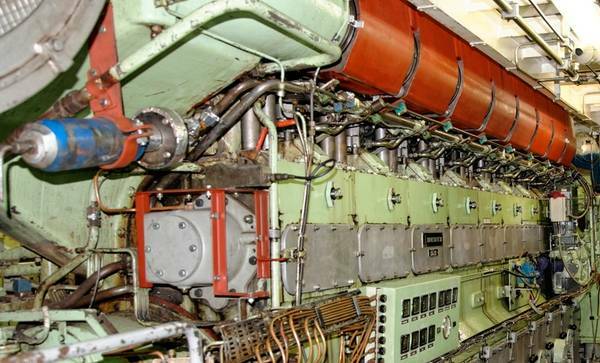 These engines and the eleven people overseeing them ensure that Polarstern can operate autonomously for months at a time. Up to 7000 kilowatts of electricity are generated in the engine room – enough to supply a small town – as well as 30 cubic metres of drinking water per day, which are generated by vaccum evaporators and reverse osmosis. Waste water is cleaned in a bioreactor and treated by UV lamps, to not disturb the fragile ecosystems of the polar regions. For these regions, the ice breaker is specifically re-inforced. Nevertheless, the hull of the ship only has a strength of 5 centimetres at the bow, which has to withstand the ice masses. It is however special hardned steel of finest quality, chief engineer Ole points out. Fig. 4: One of the four ship diesels in the engine room. © Tilo Arnhold, TROPOS. With this look inside Polarstern, we have reached the end of our cruise and of our weekly reports. In a few hours, we will arrive in Bremerhaven and go ashore. Looking back, we will remember this cruise across the Atlantic Ocean with fond memories. We want to thank our readers for their attention and participating in our cruise from a distance. Some of you will now have the chance to come on board in Bremerhaven and visit the ship. Last but not least, we also want to thank Captain Wunderlich and his crew for this wonderful trip: your hospitality and willingness to support us have made this cruise a great experience – not only in terms of scientific results. Fig. 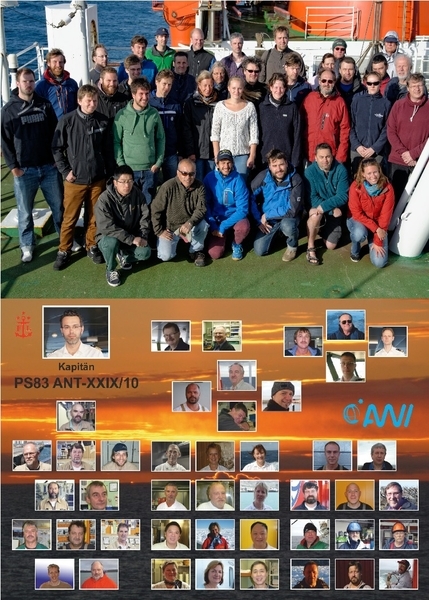 5: Group foto of the scientists (top) and an overview of the crew (bottom). © Tilo Arnhold, TROPOS, Andreas Winter (Laeisz). In the fourth week of our cruise, we have crossed the northern subtropical region. A significant drop in temperatures was noticeable, as first signe of the which awaits us back home. One Tuesday, 1st of April, Polarstern calles at the port of Las Palmas. Besides supplies, 11 furhter cruise participants came on board, who will carry out instrumental tests and begin preparations for the upcoming time in dock for Polarstern. The Microtops II sun photometer from NASA-GFSC with associated GPS unit (top left), © Dagmar Popke. The Biospherical rotating shadowband radiometer (top right), © Jonas Walther. Time series of daily mean aerosol optical depth at 5 wavelengths between 380 und 870 nm (bottom), © Dagmar Popke and Gaby Rädel, MPIMET. As already hinted at in the previous report, measurements of the aerosol optical depth are carried out on the top deck at 15-30 minute intervals during daytime since the beginning of our cruise. The aerosol optical depth is a measure of the extinction of sunlight by small particles in the atmosphere, such as sea salt, dust, or smoke as formed by biomass burning. A Microtops II sun photometer, a versatile and flexible instrument due to its small size, is used together with a GPS unit for this purpose (see figure 2). It measures the direct sunlight at 5 different wavelengths, and automatically calculates the aerosol optical depth. Figure 2 shows a time series of the daily mean values from the start of our cruise until March 31st, for wavelengths between 380 and 870 nm. In addition, the wavelength dependence allows an estimate of the aerosol particle size. Our observations suggest that the enhanced optical depth around the 22nd of March is caused by a mixture of dust from the Sahara and smoke originating from biomass burning near Nigeria, which has been transported in westerly direction out onto the Atlantic Ocean. For most of our cruise, however, only small amounts of sea salt have been observed, with an optical depth of 0.06 corresponding to clean marine air. 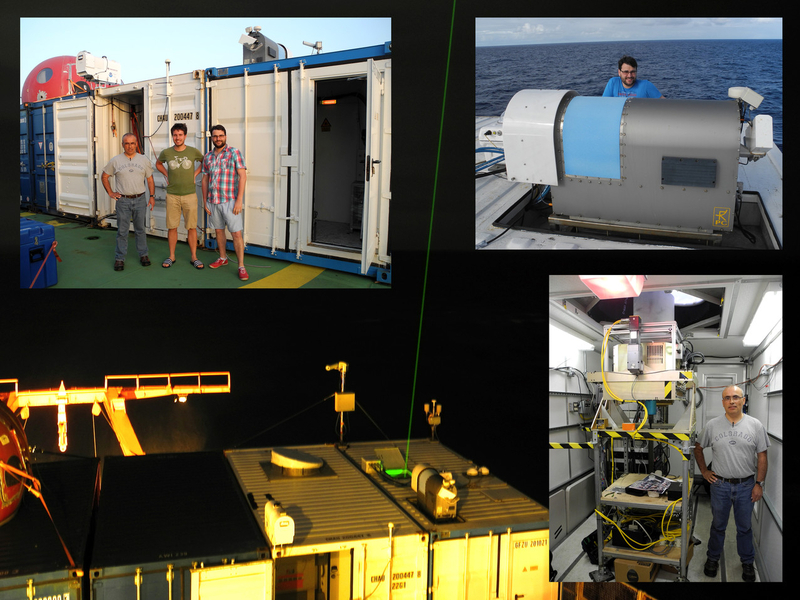 Our Microtops II photometer has been loaned to us for this cruise by NASA-GSFC within the framework of the global aerosol observation network MAN (Marine Aerosol Network), which complements the land-based observations of the AERONET stations. 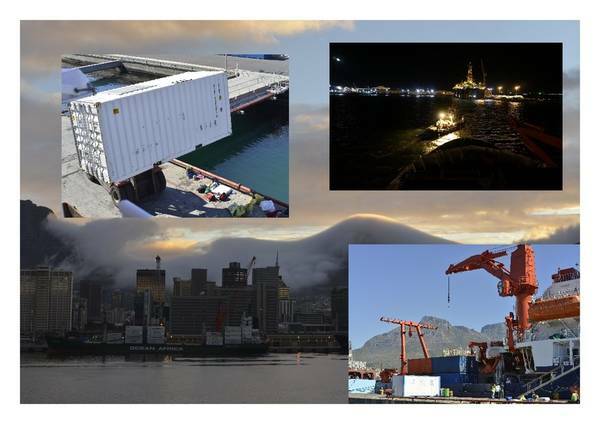 Nubiscope in the port of Cape Town, © Wolfgang Fricke, DWD. 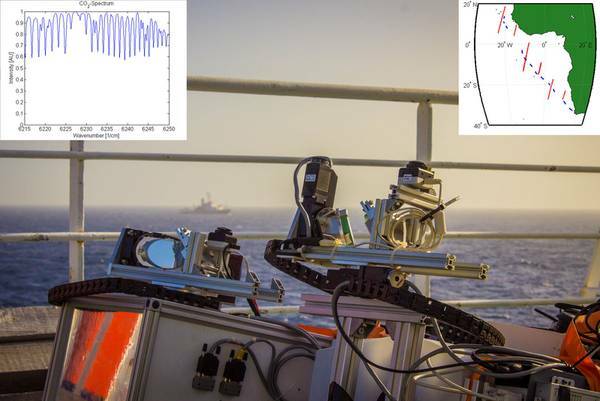 As a fully automated alternative to the sun photometer, a multispectral rotating shadowband radiometer from Biospherical Inc. is operated for the first time during this cruise, together with a self-built instrument with a broadband detector. Accurate radiation measurements are a challenge due to the constant movements of the ship. Over- and underestimations occur when ship and sensor are inclined towards and away from the sun, respectively. As this effect is most pronounced for the direct sunlight, but can be compensated as long as pitch and roll of the ship are known, it is desirable to separately measure the direct and diffuse components of the sunlight. In the case of a shadowband radiometer, a band rotates around the sensor, and will cast a shadow on the sensor during its rotation. The difference between the shadowed and non-shadowed measurements provides an estimate of the direct sunlight, which in turn can be used to estimate aerosol and cloud properties. For this cruise, we will specifically focus on the Microtops wavelengths and the derivation of aerosol properties in comparison to the MAN observations. 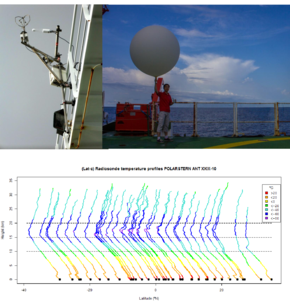 For the first time, a daily aerosol forecast is done on board in support of the aerosol measurements on Polarstern. The global aerosol model MACC (Monitoring Atmospheric Composition & Climate) is used for this purpose. This model calculates aerosol fields for the next hours and days based on satellite and AERONET measurements, and runs operationally at the European Centre for Medium range Weather Forecast (ECMWF). We thank the colleagues from ECMWF for providing the required data. Due to the relatively high uncertainties of these models, its results should be interpreted with due caution. Nevertheless, they proved very helpful to get an overview of the current aerosol conditions, and gave valuable hints of the composition and the origins of the observed aerosols. Using this forecast, it was possible to keep an eye on interesting regions. One such region was the south-western edge of West Africa, where strong biomass burning produced large amounts of aerosols, which were transported out onto the Atlantic by easterly winds. A further characteristic aerosol type for the Atlantic Ocean off West Africa is mineral dust from the Saharan desert. With the help of the aerosol forecast, it became clear early on that we would not pass a strong dust outbreak. Polarstern did however at least cross some thin dust layers. A Nubiscope is being tested for its suitability on board. It measures - in addition to the routine meteorological measurements - cloud cover and temperature at cloud base with an infrared sensor, continuously during both day and night. The measured data will subsequently be analyzed and evaluated with other measurements of comparable parameters. A first evaluation of the data collected so far shows that the NubiScope is running reliably and produces plausible results. 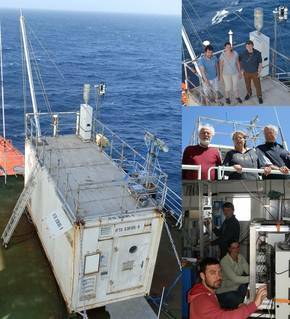 Two more instruments are mounted on the crow’s nest of Polarstern: a Licor, to measure CO2 and water vapour concentrations; and a Sonic, to measure the 3D wind components and the temperature. The data will be analyzed after the cruise to retrieve sensible and latent heat fluxes. Together with the short and longwave radiation data from the ship, they will provide an estimate of the air-sea energy budget. The LiCor and Sonic instruments (top left), © Robin Pilch Kedzierski, GEOMAR, and preparation of the release of a radiosonde (top right), © Friedrich Klappenbach, KIT). A meridional cross section of the observed temperature profiles (bottom), © Robin Pilch Kedzierski, GEOMAR. The release of 20 additional radiosondes is planned over the course of this cruise. They are the same Vaisala model as used by the German Meteorological Service for the regular daily release at noon time on Polarstern, and will complement these ascents. They measure vertical profiles of temperature, humidity and horizontal wind up to approximately 30km altitude. Our focus is the tropopause region, the boundary between troposphere and stratosphere. Of interest are special features like strong temperature inversions, or the existence of a double tropopause. The graph in figure 4 shows all the temperature profiles obtained during the cruise up to date. The coldest, highest, and also sharpest tropopause is observed in the vicinity of the Equator (<-80°C, about 17 km). The sharpness decreases towards the subtropics and mid-latitudes. A secondary temperature minimum at approximately 10km altitude, characteristic of a double tropopause, can be observed at 30ºN. In the next and final weekly report of our cruise ANT-XXIX/10 or PS83, we will present an overview of the observations of marine mammals and birds along our cruise track. In addition, some details will be given on the instrumental tests which are carried out at the moment. After crossing the equator last week, RV Polarstern is now traveling through the northern trade wind belt. There, a rare encounter took place – already at the very end of the previous reporting period: two German research vessels met in the middle of the ocean. 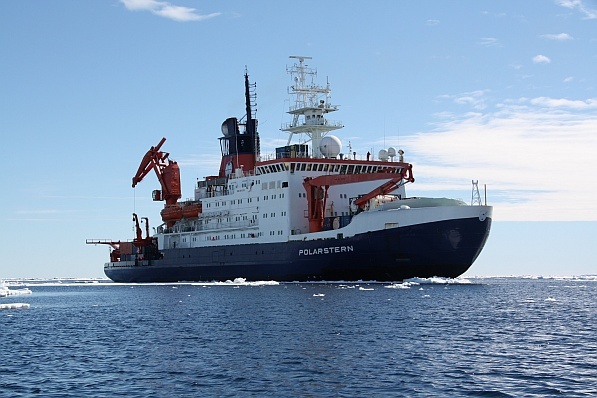 Contacts between cruise participants had revealed that Polarstern would cross the research area of the RV Meteor, which is investigating currents and exchange processes in the oxygen minimum zone off the coast of West Africa. An exact place and time for the meeting was quickly agreed upon, at 13:00 o'clock UTC and at 21°N 11°W. When Polarstern arrived at that point, Meteor was just finishing station work to release a glider into the ocean. Zodiacs were quickly brought into the water, and used for frequent shuttle transfers between the vessels. Both the scientists and the crew took the opportunity to visit the other ship, and learn about the instruments, the work carried out on board, and the scientific goals of the expeditions. After 4 hours and a welcome break from the daily routine on board, Polarstern continued its cruise in northerly direction towards home. Figure 1: Aerosol container on the top deck, including a photo of the colleagues carrying out the aerosol and air analyses. © Maik Merkel, TROPOS, and Simon Jungblut, PoIE. As already mentioned in last week's report, the OCEANET project focuses on the exchange of fluxes and energy between the ocean and the atmosphere. In addition to the daily water samples of the surface micro layer, continuous measurements of aerosols are carried out in a container on the top deck. Inside this aerosol container, several instruments determine the physical and chemical properties of aerosol particles. All measurements are focused on investigating the sources and formation pathways of airborne particles to enhance our knowledge about the underlying processes. The starting point of the analysis is a mobility spectrometer, which provides information about the particle number size distribution of the ambient air. This allows the determination of the number of particles starting with small particles with diameters of only 10 nm up to sea salt particles with diameters larger than 1 µm in the marine boundary layer. It enables a characterization of the lower tropospheric aerosol including information about its sources, e.g. whether it is of marine origin or the result of biomass burning from the Western African savannas. When our cruise leg started from Cape Town, the aerosol was of marine origin from the Antarctic region, as revealed by back trajectories. The total particle number concentration was lower than 100 particles per cubic centimeter – in urban areas number concentrations of some thousand particles per cm³ are typical. After passing the equator, the total particle number increased significantly due to the continental influence of Africa, and transport of aerosol by the northern trade winds. Mineral dust as significant part of the mixed aerosol was likely observed during this time period. Based on this measurement, the activation of aerosol particles and their ability to form cloud condensation nuclei is investigated with another spectrometer. The results provide information about which particles of a given size can become cloud droplets at values of oversaturation ranging from 0.1 to 1 percent. The formation of clouds including their lifetime in particular over oceans is not yet completely understood. For investigating the optical parameters of the marine aerosols, three additional instruments are found in the aerosol container. The absorption coefficient is measured by two absorption photometers at wavelengths of 530nm and 637nm. They allow the determination of the amount of soot contained in the aerosol. Especially after crossing the equator, this value increased significantly due to the continental influence by biomass burning. The scattering behavior is investigated with a nephelometer. Different backscattering signals at blue, green and red wavelengths allow conclusions about particle shape and density. For the chemical characterization of the aerosol, filter samples are taken with a “Digitel High Volume Sampler” on top of the container covering 24-hour periods. After the expedition the filters will be analyzed in the laboratories of TROPOS in Leipzig. The same procedure is applied to daily or twice-daily denuder measurements, which sample chemical substances such as amines in the gas phase. The measurements are supported by continuous records of relevant atmospheric gases like ozone, nitrogen oxides and sulfur dioxide. Additional chemical investigations are carried out with impactors on the observation deck. They separate airborne particles according to their aerodynamic size, and collect them on foils which are later analyzed for chemical compounds and stable isotopes (nitrogen and sulfur). Particles of different size generally have different chemical composition. Samples collected so far indicate that during the Polarstern cruise on the South Atlantic, no aerosol influenced by continental origin was found. North of the equator, however, the air mass was substantially influenced by the African continent: the larger particles showed evidence of mineral dust, whereas the smaller particles can likely be attributed to burning processes due to their grey color. In addition, air samples are taken using evacuated metal flasks, which will be analyzed for volatile organic compounds in Germany. Prior measurements have shown that gaseous ammonia (NH3) and particulate ammonium (NH4+) coexist in the lower atmosphere over the ocean. These components are collected on filters on board (3 NH3 absorption filters behind an NH4+particle filter) and later analyzed for their stable nitrogen isotopes. The results can provide hints towards the ammonia reaction pathways in the atmosphere. As source and sink the ocean has a strong impact on the climate gases CO2 and N2O. Ratios of stable isotopes (13C/12C and 15N/14N) can give valuable hints for characterization of the exchange rates between air and water. Therefore, air samples from the atmospheric boundary layer and from air in equilibrium with sea surface water are taken and later analyzed for these isotope ratios. Carbon dioxide and methane are also in the focus of three scientists from Karlsruhe. They came on board Polarstern in the search of sources and sinks of these greenhouse gases, which are the main contributors to global warming. With a spectroscopic analysis of direct sunlight, the scientists are capable of retrieving the amount of carbon dioxide and methane between the sun and their instrument. A novel instrument constructed especially for this purpose is tested on board. “At first we had trouble with electronics that kept failing due to sea salt. But with the support of the crew we were able to quickly solve this problem”, comments Friedrich Klappenbach from the Karlsruhe Institute of Technology (KIT). The scientists are happy about the outcome of the campaign up to now. “I am really excited about the parallel measurements during the satellite overpasses” Klappenbach continues. To validate the measurements taken from space with the Japanese satellite GOSAT, the colleagues from Japan adjusted the scanning mode of the satellite to obtain a maximum number of coincident measurements with the ones on Polarstern. But before these data can be compared, they have to be subjected to a careful analysis. “This will take some time and is planned to be done after the campaign.” Until the end of the cruise, the scientists from Karlsruhe hope for ongoing good weather, as this is needed for their measurements on the top deck. On this deck, also some other sun-related measurements are conducted, which will be presented in the next weekly report. Coming from the southern trade wind region, RV Polarstern passed a major portion of the tropics during the second week of our cruise. In consequence, the cloud regime changed from scattered cumulus clouds to deep convective systems and back to nearly cloud-free conditions north of 5°N at the end of this week. In that region, however, visibility was strongly reduced by a smoke and dust plume blown out onto sea from the African continent. The reason for this plume can probably be found in the traditional burning of biomass in the savannas of Western Africa. This change of atmospheric properties and clouds is the central focus of the OCEANET project, which is the biggest experiment on board of Polarstern during this cruise. Again, a measurement container constructed especially for this project is on board, which has been built and is operated by scientists from Leipzig. It carries out observations of the atmosphere, specifically aerosol particles, clouds and atmospheric radiation. For the evaluation of climate models, and the determination of their uncertainties, spatially and temporally highly resolved measurements of these characteristics are required. The OCEANET container is equipped with a number of remote sensing instruments. Vertically resolved profiles of aerosol particles, clouds, and water vapor are measured by a laser using the lidar principle. The laser emits laser pulses in ultraviolet, visible and infrared wavelength ranges, which are scattered back by air particles, cloud droplets, ice crystals and water vapor, and subsequently collected by a telescope. Due to different scattering properties, we are able to distinguish between ice and water clouds as well as between different aerosol types, e.g. desert dust, smoke and sea salt. After measuring solely sea salt during the beginning of the cruise, we have recently observed the previously mentioned aerosol layer originating from the African continent. In addition we found cirrus clouds in heights above 12 km in the equatorial regions. A microwave radiometer situated on top of the container measures the atmospheric emission in millimeter and centimeter ranges. From this emission temperature and humidity profiles as well as the integrated cloud liquid water path can be derived. Additionally we are running a weather station of the German Meteorological Service, short- and long wave radiation measurements, and a fisheye cloud camera. These observations can be compared to previous results in order to determine characteristic values and to identify interesting variations. As additional benefit of this transfer cruise, it is possible to investigate the variability of these measurements across several climate zones. For the first time, a cloud radar is also on board during this cruise as a complement to the OCEANET measurements. 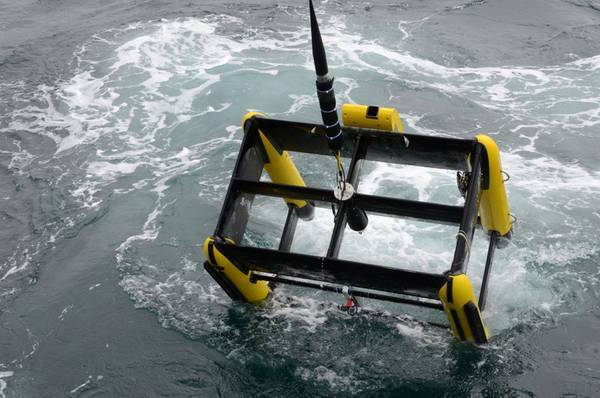 This instrument has been developed and is operated by colleagues from the NOAA Earth System Research Laboratory. Similar to the lidar, it sends out pulses with a power of 1740 W. These pulses do however have a frequency of 94GHz in the microwave spectral region. Together with the calibrated reflectivity from cloud droplets, the instrument also records the vertical velocity of the droplets based on the Doppler effect up to a height of 6 km, with the purpose to understand the dynamics and microphysical properties of cloud droplets. The radar is mounted on a stabilized platform, a gyro records ship pitch, roll and heave to compensate the ship motion to ensure that the radar is pointing vertically with an accuracy of 0.5 degrees. 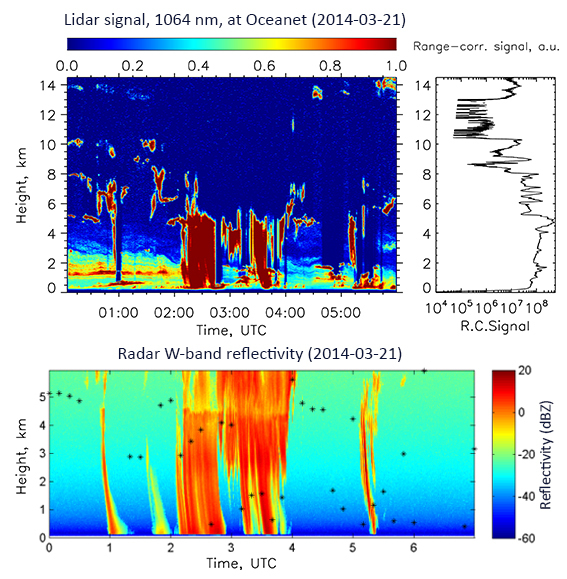 Image 2: Lidar an Radar Measurements of March 21, 2014 © Sebastian Bley, TROPOS, Sergio Pezoa, NOAA. 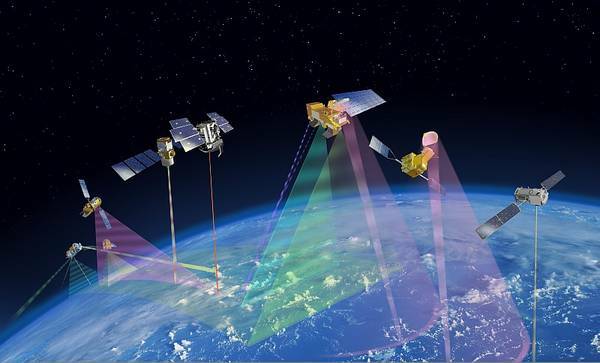 Since 2006, the cloud radar CLOUDSAT and the cloud-aerosol lidar CALIOP fly in space as part of the A-train, a constellation of currently 5 earth-observing satellites. As they provide measurements similar to ours from space, a comparison with our ship-borne observations can help to better understand the accuracy and consistency of the datasets. Some important differences have to be recognized, however: our ship travels at a cruise speed of 10.5 knots, while the sub-satellite point moves with roughly 6 km per second. Due to its height of 690 km above sea surface, the satellite instruments can only distinguish coarser cloud structures, with horizontal resolutions of up to 300 m for the lidar and 1.5 km for the radar. To achieve an optimal comparison, our course has been adjusted in such a way that Polarstern has reached the ground track of the A-Train 1-2 hours before an overflight. We have then followed the track for the next 3-4 hours, with the satellites catching up and overtaking the ship during that time. As the ground track is only known 2-4 weeks in advance with sufficient accuracy, this strategy has required short-term adjustments to the ship's route, which could successfully be made thanks to the excellent support by the ship’s crew. Up to now, we have realized 4 such overflights during the past 2 weeks, and two further overflights are planned for our way to Las Palmas. A preliminary comparison of the GPS waypoints indicates that we have matched the course of the satellite ground track with an accuracy of about 50 m, which is significantly better than our expectations. 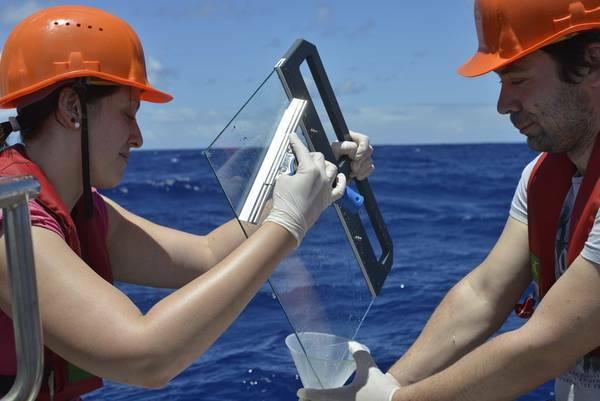 Towards the goal of better understanding air-sea interaction and specifically the exchange of organic matter, the surface film layer of the Atlantic's ocean surface is again being investigated during this cruise. Samples are taken at the surface by dipping a glass plate vertically into the ocean, pulling it slowly back out, and wiping the surface film with a teflon glass wiper into small plastic bottles. Reference samples are taken with a telescope pole in 2 m depth. To exclude an influence by our ship, these samples are collected from a zodiac, which is brought to water during a stop of Polarstern around noon time. The water and surface film samples are frozen on board and will be chemically analyzed at TROPOS after the cruise. The analysis of samples taken during previous cruises has revealed the enhanced content of a chemical substance in the surface film, which is currently being investigated as a potentially important factor in the formation of clouds. These investigations will be continued and extended during this cruise. 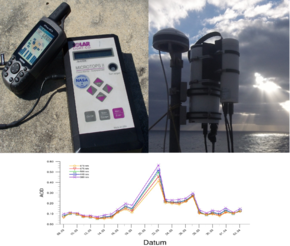 An overview of complementary analyses of the chemical composition of marine aerosol and air samples carried out during the cruise will be given in next week's report. Besides the normal scientific routine, another highlight of this cruise occurred during this week. On the morning of the 19th of March, RV Polarstern crossed the equator. 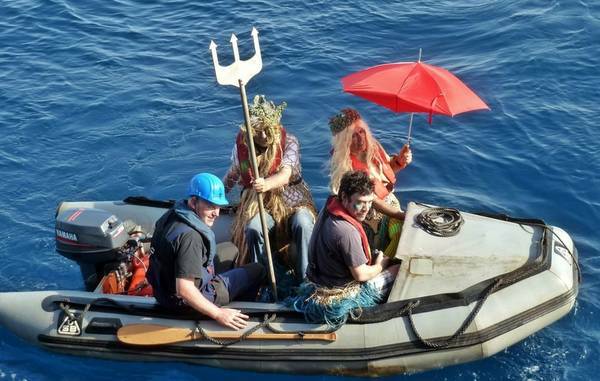 Neptune himself came on board and overlooked the baptism of previously unbaptized cruise participants. Figure 4 shows him together with his lovely wife Thetis on a zodiac paying his visit to our ship. The vessel Polarstern will end its successful and exceptionally long research campaign in the southern hemisphere and return to its home port Bremerhaven. However there are still 7,500 nautical miles ahead of us after having left Cape Town. We – a group of 28 scientists – want to use this opportunity for a number of measurements and observations. In this and in the following weekly reports we will inform those left behind at home, family, and the interested public about the life on board, and in particular the scientific work which will be carried out here. Each week, we will present an overview of some of the different projects and groups. In the framework of the OCEANET program, detailed observations of the atmosphere will be carried out targeting aerosols and clouds, including their effect on atmospheric radiation and atmosphere-ocean exchange. For the first time, we will adjust the exact course of Polarstern to match the ship track to overflights of the A-Train satellite constellation, which among other instruments contains the space-born aerosol lidar CALIOP and the cloud radar CLOUDSAT. This offers the unique opportunity to intercompare vertical profiles of clouds and aerosols taken from the ground and from space. The distribution of birds and marine mammals along the route will be recorded by observers from the bridge. In addition, aquaria with organisms collected in Antarctica during the previous cruise leg will be transported to Bremerhaven. During our stop in Las Palmas on April 1st, thirteen further cruise participants will embark for evaluations of the HYDROSWEEP DS III multi-beam sonar and the TRIAXUS towed vehicle in the Bay of Biscaya. But let's start this report beginning our cruise in Cape Town. On March 5th, RV Polarstern entered the port of Cape Town at 4am coming from Antarctica. Thus, unloading and loading operations could start during the early morning hours, and our three measurement containers were brought on board over the course of the day. The following day, the ship was handed over from the old to the new crew, and we were allowed to come on board with a group of about 15 scientists to begin setup of our experiments. Fortunately, only minor problems were encountered, which could all be solved with the excellent support of the crew and some advice from home. Prior to the cruise, the tentative departure was changed to March 7th, 20:00, so boarding was scheduled for noon of that day. In port, however, we had to learn that there were supply shortages of fuel. Thus, bunkering could only begin around noon on the 8th. In consequence, we only left port around 22:30 of that day. A strong breeze of 6 Beaufort welcomed us at sea. The wind increased to 8 Beaufort over the course of the next day, subjecting the scientists and experimental setups to a first test of their seaworthiness. For some colleagues there was not much time to think about sea sickness and weather conditions. The group of eco-physiologists had to take care of the aquarium systems with their valuable freight, the living fish. There was no access to fresh sea water in the port and due to the delay, water had to be exchanged as soon as possible. This work lasted until late in the night. Living fish had been caught with bottom trawls in the Filchner area of the Weddell Sea during the previous leg PS 82. The area of the Filchner shelf has been identified as a biological “hotspot” because of its specific hydrodynamic properties. Therefore, the aim of the previous cruise leg was to study the biological productivity of the Filchner system with its energy conversion of the trophic food web up to the highest top predators like sea elephants. Antarctic fishes feed on e.g. zooplankton and are in addition a valuable energy source for higher organisms and represent a special position within this food web. Around 150 fishes and some octopods were brought alive on board Polarstern and are kept in a special aquarium container at water temperatures of 0°C since then. Antarctic organisms react extremely sensitive as to environmental change, therefore the scientists have to take special care of these organisms during our cruise to keep the aquarium conditions as constant and optimal as possible. A regular exchange of sea water and tests of the water quality are necessary. For this purpose a cooling reservoir tank with a volume of around one ton is filled via a pump, where the sea water is cooled down to 0°C. An additional UV-lamp is used to eliminate the bacterial content in the sea water to reduce the risk of infections. The prepared sea water will then be used to exchange the water in the tanks of the aquarium container. This timely procedure can be extremely difficult especially in tropical areas where the water can easily reach temperatures above 30°C. Nevertheless, everything worked out fine until now due to the excellent support of the machine crew and the organisms are still in good shape. After transportation of the animals to the Alfred-Wegener-Institute in Bremerhaven, the organisms will be brought directly to the aquarium system of the institute and kept for further experiments regarding the topic of climate change. The impact of the ongoing warming and increased CO2 concentrations, which reduces the sea water pH in the oceans, will be investigated on these species. These studies will give further insight how climate driven changes will affect Antarctic organisms and how the Antarctic ecosystem will be influenced in the future. As a further consequence of the strong winds at the start of the cruise, it was impossible to take daily water samples of the sea surface film during the first two days, and on the 12th of March as originally planned. On the 12th, the first satellite overflight took place, followed by a second overflight on the 15th. More details about both topics will be covered in next week's report. Furthermore, there are unconfirmed rumors on board about a sighting of Neptune on the helicopter deck during the night of the 13th. Supposedly, he showed great interest in the ship and specifically the polywogs (unbaptized) approaching the equator. [Translate to English:] Bericht vom 9.3. Am 5.3. lief die FS Polarstern aus der Antarktis kommend früh morgens in Kapstadt ein, am selben Tag wurden noch die Container geladen. Leider konnten wir an diesem Tag noch nicht mit dem Aufbau der Experimente beginnen, dieser fand dann am 6. und 7.März statt. Dabei gab es zum Glück nur kleine Probleme, die alle durch die hervorragende Unterstützung der Mannschaft und aus der Heimat gelöst werden konnten (konkret: Stromversorgung Aerosolcontainer, Klimaanlage OCEANET Container, Anlieferung Chemikalien/Gefahrgut). Nachdem die geplante Abfahrt im Vorfeld kurzfristig vom 8. März 12 Uhr auf den 7. März, 20 Uhr vorverlegt worden war, und somit die Wissenschaftler bereits am 7.3. mittags einschifften, stellte sich nun heraus, dass es im Hafen leider Engpässe bei der Treibstoffversorgung gab, und wir die benötigte Menge Treibstoff erst im Laufe des 8.3. bunkern konnten. Somit liefen wir erst am 8.3. um 22:30 aus. Auf See begrüßte uns direkt ein stürmischer Wind, der von anfänglichen 6 Beaufort im Verlauf des nächsten Tages auf 8 Beaufort auffrischte und die Wissenschaftler und Experimente direkt einer ersten Seetauglichkeitsprobe unterzog. Dadurch war auch erst am 11. März ein Stopp zur Probenentnahme des Oberflächenfilms mittels Schlauchboot möglich, der problemlos und zügig verlief. Am heutigen Tage werden wir um 11:00 UTC auf der Position 23° 08.64'S, 5° 03.42'E erneut zur Probenahme stoppen, um danach bis 14:40 UTC entlang des Bodentracks von Cloudsat/Calipso zu fahren, die uns um 13:39 UTC überfliegen werden. Somit hoffe ich, dass wir hier einen ersten Datensatz zum Vergleich vom Schiffs- und Satellitenbeobachtungen bekommen, im Anschluss wird mit dem Kapitän abgestimmt, für wie viele solcher Überflüge wir Zeit haben (angestrebt sind 4-5). The transfer cruise ANT-XXIX/10 from Cape Town to Bremerhaven ends an extraordinarily long research campaign on the southern hemisphere, including overwintering in Antarctica. After 1.5 years, Polarstern will finally return to its home port. 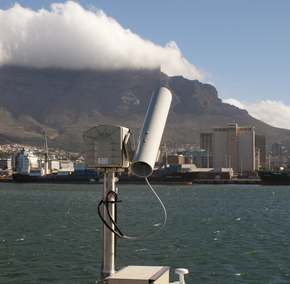 In the framework of the OCEANET programme, detailed observations of the atmosphere will be carried out, targeting aerosols and clouds and their effect on atmospheric radiation and atmosphere-ocean exchange. In addition to previous measurements, a W-band cloud radar from the US National Oceanographic and Atmospheric Agency (NOAA) will be operated on board for the first time providing vertical cloud profiles. 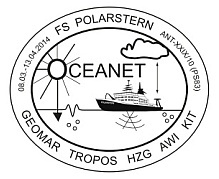 Also, spectroscopic measurements of trace gas concentrations will be carried out as part of OCEANET. As a further exceptional aspect, the route will be chosen to obtain optimal matchups with satellites from the A-Train constellation, specifically the CALIOP aerosol lidar and the CLOUDSAT cloud radar. The resulting datasets will offer the unique opportunity to compare vertically resolved profiles of clouds and aerosols from the satellite and ground-based perspective. The distribution and frequency of sea birds and marine mammals along the route will be determined by human observers. 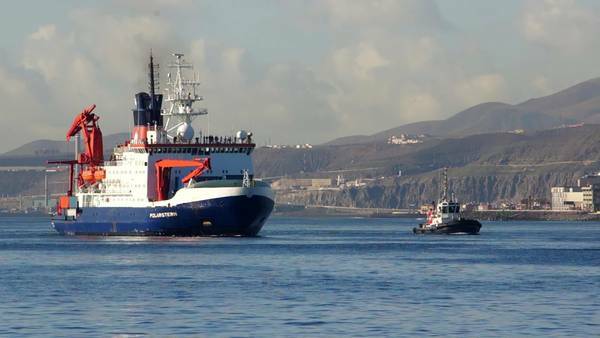 Also, aquaria with Antarctic fish will be transported to Bremerhaven for further studies, and some instrumental validation will be carried out after a stop in Las Palmas en route to Bremerhaven.